Clina Polloni Design is a social media expert, developing campaigns, using the power of social media for the benefit of our clients. In our approach, we seek to understand your business objectives, and define the social media strategy that delivers on those objectives. Social media are media for social interaction, using highly accessible and scalable publishing techniques. Social media use web-based technologies to transform and broadcast media monologues into social media dialogues. Businesses refer to social media as user-generated content (UGC) or consumer-generated media (CGM). Social media have become appealing to big and small businesses. Credible brands are utilizing social media to reach customers and to build or maintain reputation. As social media continue to grow, the ability to reach more consumers globally has also increased. This means that brands are now able to advertise in multiple languages and therefore reach a broader range of consumers. 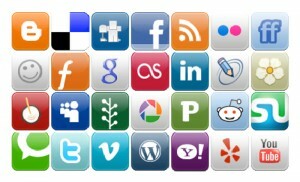 Social media have become the new “tool” for effective business marketing and sales. Popular networking sites including Google Plus, Facebook and Twitter are social media most commonly used for socialization and connecting business, friends, relatives, and employees. Blogs: for sharing on-going thoughts or comments about a particular topic, business, or trends. Google Plus: interactive tool for sharing on the web. Facebook: for connecting socially with personal friends or friends of your company or organization. Also for internet advertising. LinkedIn: for making professional connections. Twitter: for instantly communicating short bursts of information to a connected social group or clients. Digg: a website that allows you to find and share news in your social network. Delicious: a website of popular website bookmarks. Clina Polloni Design can help you build your business in the internet using the tools of social media.